The rare combination of high crude prices and a weakened rouble will bring about a windfall for Russia’s oil exporters as well as the country’s Treasury, which will receive $24.5 billion in energy export revenues. The Russian economy has found itself in a fairly unusual situation in recent weeks: oil prices remain high, but the rouble has weakened in value against leading international currencies. This is a dream come true for oil exporters and the Russian treasury is likely to benefit from the increase in revenues. Ordinary consumers, however, will suddenly find goods imported from abroad more expensive. Traditionally, the rouble exchange rate has tracked the price of oil very closely, but over the past few months, the Russian national currency seems to have decoupled from oil. The combination of cheap rouble and expensive oil is fairly unique. At the height of the 1998 and 2008-2009 economic crises, the situation was very different, said Mikhail Krylov, head of the analysis department at United Traders. In 1998, the dollar climbed a record 247 percent against the rouble, while Brent crude fell 33 percent to $12.76 dollars a barrel. In 2009, oil prices fell by 36 percent, and the ruble reached a new low of $36.73 to the dollar, Krylov said. Bank of America Merrill Lynch analysts also said that the combination of cheap rouble and expensive oil is a strong argument in favor of investing in Surguzneftegas. Krylov estimates that the Russian treasury’s energy export revenues will climb to 862 billion roubles ($24.5 billion) this year thanks to the cheap rouble and expensive crude. 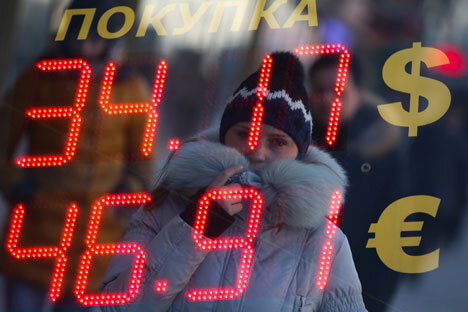 Russian consumers are the only group that stands to lose from a cheaper rouble. Car dealerships are already forecasting an increase of 10 percent in the average price of an imported car. Most foreign automakers with large sales in Russia are already assembling their cars in-country using Russian-made components, but some of the most expensive parts still have to be imported. Russian importers of consumer goods and alcohol also say they will have to raise their prices. Tour operators have been one of the first to react to the fall in the ruble exchange rate; it will now be more expensive for Russians to spend their holidays abroad. This article can be read in the original Russian at Vzglyad.